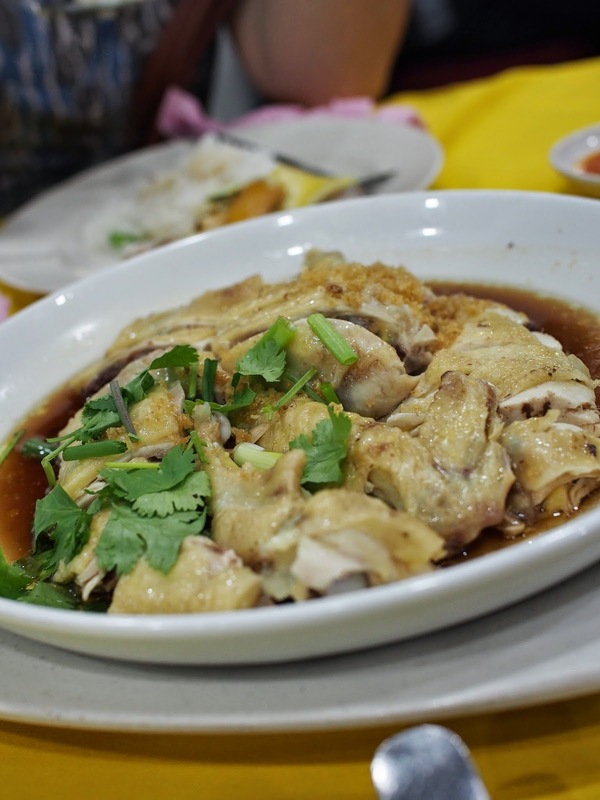 ChrisCROSS: Wong Hee Restaurant, Bandar Mahkota Cheras, Selangor. Wong Hee Restaurant, Bandar Mahkota Cheras, Selangor. 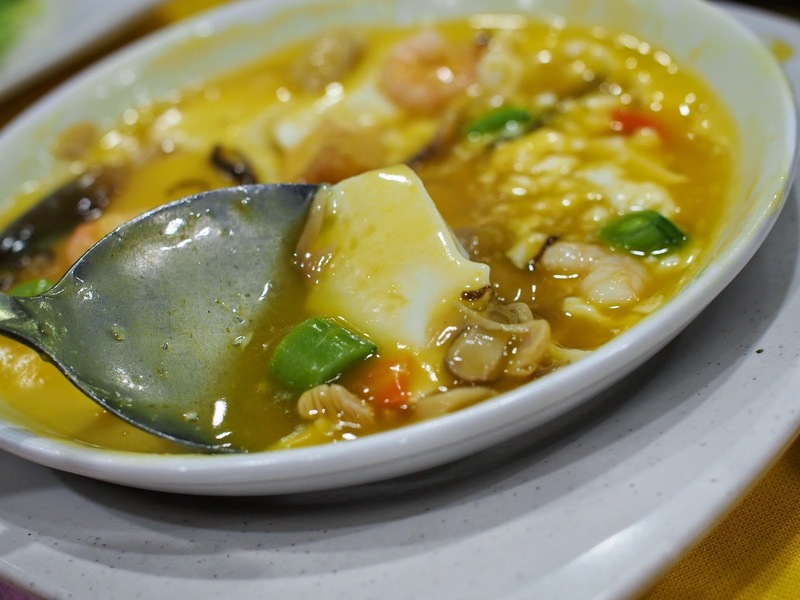 This is one our favourite restaurants around our neighbourhood in Sg Long/Mahkota Cheras. This joint serves good food at a cheap price. Moreover, service is often prompt and friendly. Over the weekend, after some chores in Sg Long, we decided to pop over to have a quick dinner. One of the dish that we always order is the pumpkin tofu. This dish is like a 2 in 1 dish. The base layer consist of steamed egg. On top of it will be the fried tofu and other condiments like mushrooms, vege etc. All these in a bath of pumpkin gravy. The texture of of the steamed egg is smooth and it is not unlike chawanmushis you get at Japanese restaurants. The pumpkin gravy is just of the right consistency (not to thick or too runny to go with rice. When we were deciding on what vegetable to order, we were told that the fancifully named "Green Dragon" vegetable was available. 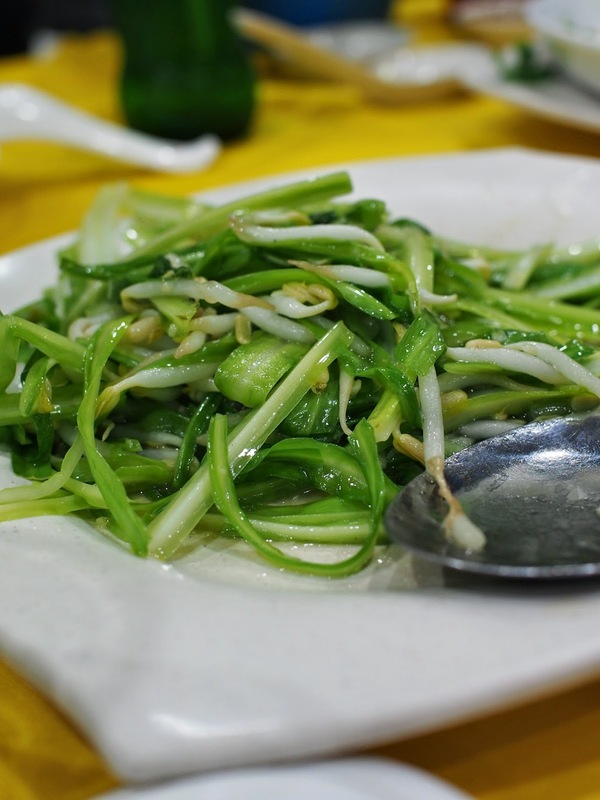 This is a leafy vegetable that looks like Chinese chives but does not carry the strong taste that put some people off. It goes well stir fried together with bean sprouts. 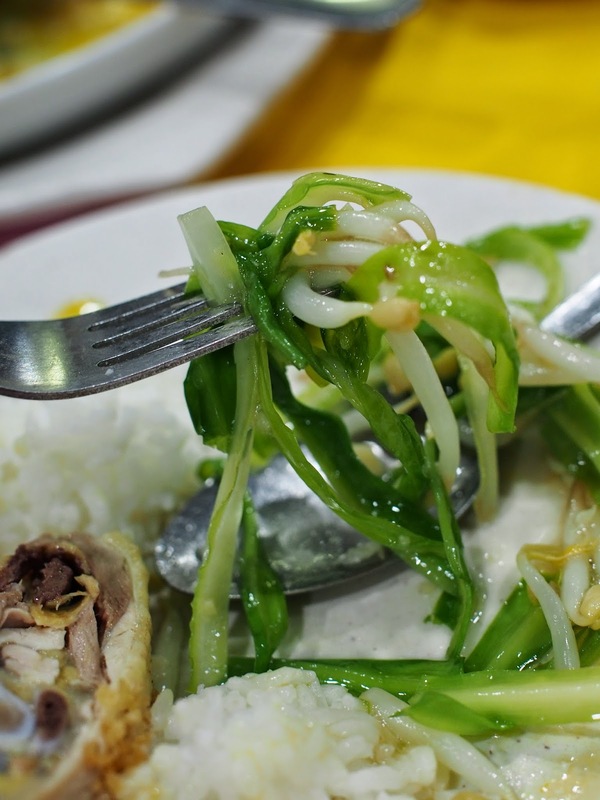 The crunchiness of the bean sprouts and leafyness of the "Green Dragon" vegetable compliment each other. It would taste better if some salted fish is added into the stir fry. However, we were not up to something too salty that day hence we settled for a garlic stir fry. Next up, is the steamed free range chicken that came highly recommended by the maitre'd. For the uninitiated, it is not too easy to find free range chicken in Malaysia (strange that it may sound) and it always comes at a high price. In addition to that, even though restaurants claim to serve free range chicken, there is a tendency to serve frozen free range chicken. A frozen free range chicken would have lost most of its flavour and will often carry the thawed meat taste. However, I am glad to say that the free range chicken that was served was indeed fresh and worth the extra money. Texture of the meat was just nice unlike farm fed chicken which is always too though at the breast meat and too soft/fatty at the thigh and drumsticks. By the way, have I mentioned that the speciality of this joint is their claypot fish. Look around and you would notice that every table would have at least ordered some form of claypot fish. We settled for the more economical red tilapia. 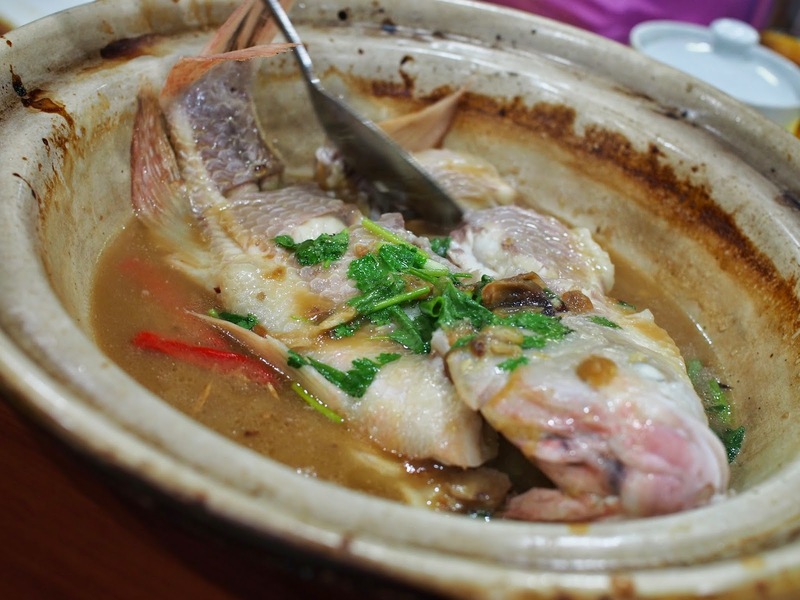 The fished is basically steamed before being placed into a sizzling claypot. After that, the chef will pour the secret recipe gravy over the fish before it is served. 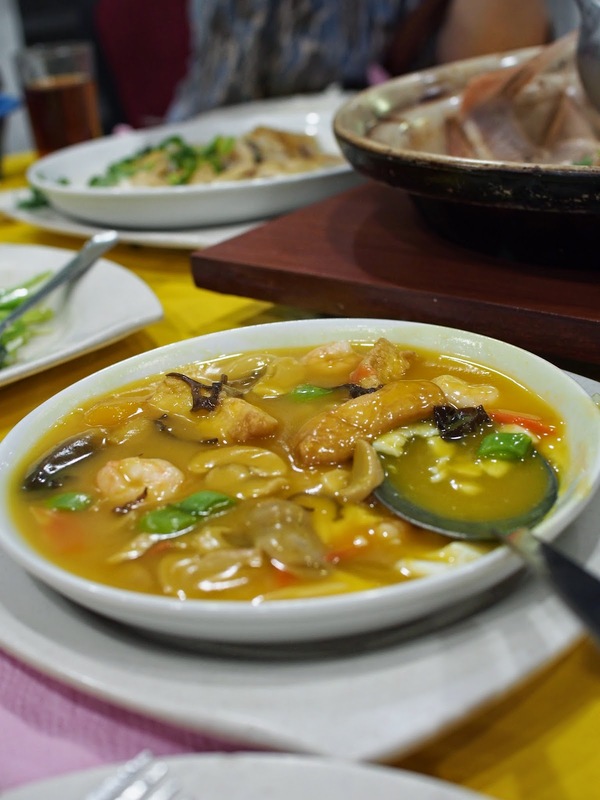 The dish carries a nice fragrant smell enhanced by the small amount of Chinese cooking wine that they add in. When eating tilapia, one point to note that it will always carry a muddy taste. This is due to the environment and also conditions these fish are usually reared in. Hence, red tilapias are usually not suitable for steaming and more suited for other styles of cooking like deep fried. However, the tilapia served at Wong Hee does not have this problem. 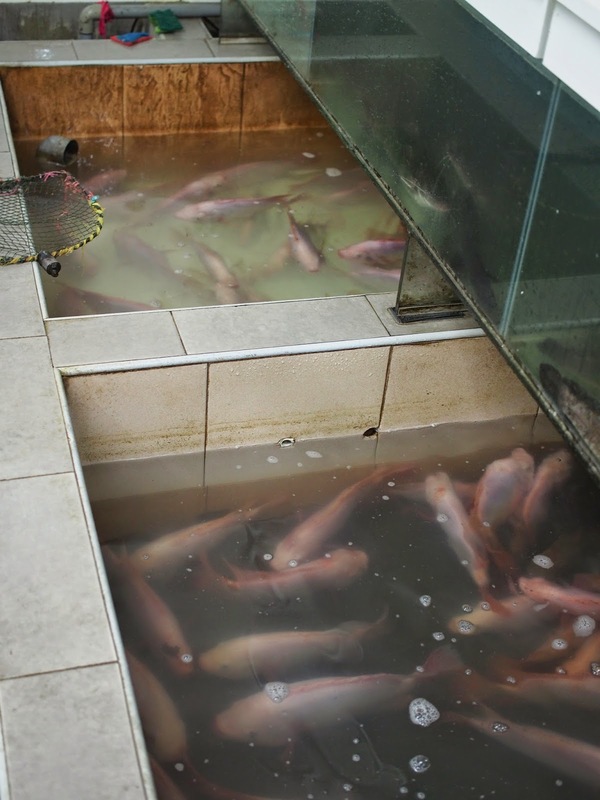 The reason the tilapias here do not carry the muddy smell is that the fish are reared in clean water for a certain number of days before they are served. This way, the fish is somehow "domiciled" ridding it of the muddy taste and also improving the texture of the flesh. One can visit the "aquarium" at the back of the shop. The more expensive fish like the pak sou gong and shang yu are kept in the glass aquarium. As mentioned, prices here are quite reasonable. For a dinner for 4 with 4 dishes and 2 small bowl of soup with tea, the total bill came to RM108. I would highly recommend this to anyone looking for a quick and reasonably priced meal. A man of diverse interest with a weakness for good food. Tries to compensate that with outdoor activities. (c) Christopher Yap. Simple theme. Powered by Blogger.